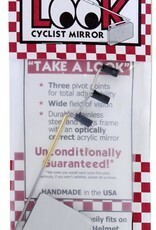 The most adjustable, highest quality eyeglass (or helmet visor) mirror made. Popular choice for those of us with a wide variety of bikes (the mirror is on you, not the bike). I have been personally using this mirror for years and can't imagine riding without it. Easy to adjust and great optics (real mirror), so you're safe on the road. As-is, this mirror can be mounted onto eyeglasses or onto a helmet visor. With optional Helmet Mount the mirror can be mounted to a helmet without using a helmet visor.